This week, Spotrac.com, who analyzes the salary cap, player performance, and makes projections for future contracts, released their most recent contract valuations for the big name Dallas Cowboys who will be approaching the offseason looking for a new contract. 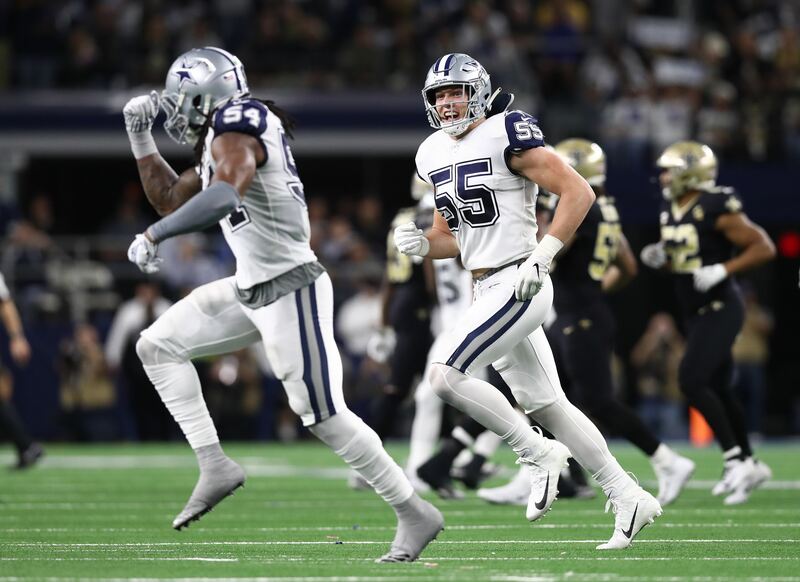 Between, DeMarcus Lawrence, Dak Prescott, Amari Cooper, and Ezekiel Elliott, the Dallas Cowboys will have a lot of negotiating going on this offseason and will be handing out some big bucks. Obviously, the one that we're most concerned about here in Cowboys Nation is what the Dallas Cowboys front office is going to do with Dak Prescott. Many fans and pundits aren't sold on Dak Prescott as a franchise quarterback, but he is a franchise quarterback and he's about to get paid like one. Over The Cap is projecting the 2019 salary cap to be around $190 million this season, which would put Dak Prescott's projected salary figure of $25.2 million at around 13.2% of this season's salary cap. And percentage of the cap is the more important number to look at when judging Dak Prescott's figure. When Russell Wilson signed his four-year extension in 2015 that averaged out at $21.9 million per year, his contract took up 15.3% of the salary cap when signed. So yes, in total dollars, Prescott's salary will be higher, but in percent of the cap it will be lower. If you give Dak Prescott 15.3% of the projected 2019 salary cap, you’re looking at $29.07 million per year. When Spotrac does their salary projections they attempt to find quarterbacks who have had similar careers to the player and use those players as a gauge for what the projection might be, including adjustments for the market rate for the position and the growing salary cap. So, Spotrac has Dak Prescott's career thus far comparable to Blake Bortles, Kirk Cousins, Russell Wilson, and Cam Newton. Below, you can see the contract numbers for those players that Dak Prescott compares to and the age when they signed their deals. That's an interesting mix of players. Let's also take a look at the top six quarterback contracts in the NFL. Let's start first with Derek Carr, who has the sixth highest average annual pay rate at just over $25 million per year. He signed his deal two years ago in the 2017 offseason. Another contract I like to look at when attempting to figure Prescott's number is Jimmy Garoppolo. Garoppolo got his deal from the San Francisco 49ers after only seven NFL starts (two with New England Patriots and five with the 49ers). His contract made him the fourth highest paid quarterback at $27.5 million per year. Again, after only seven NFL Starts. Dak Prescott has 48 starts in the NFL regular season, and a career passer rating of 96. Of the top six quarterback contracts listed above, only Aaron Rodgers and Jimmy Garoppolo have a higher career passer rating than Dak Prescott. 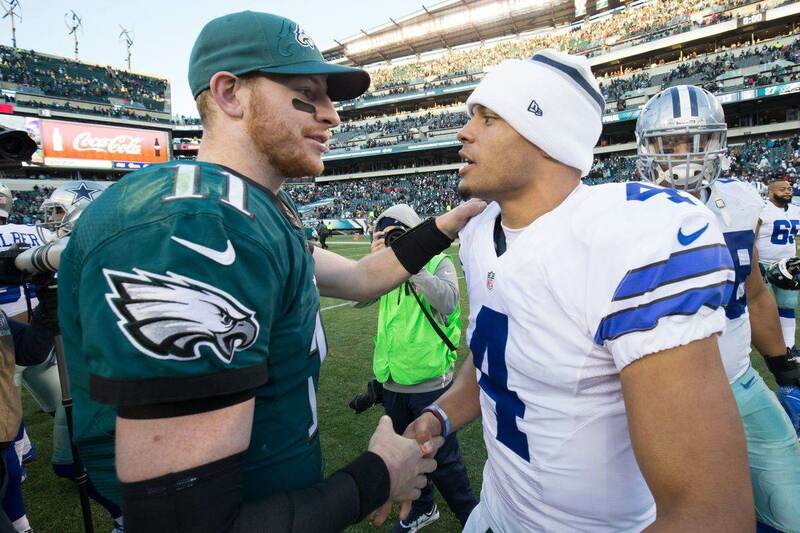 If you look at the top 10 quarterback contracts in the NFL now, only Aaron Rodgers, Drew Brees, and Jimmy Garoppolo have a higher career passer rating than Dak Prescott. You can argue that Prescott's teams have had more success than Matthew Stafford, Kirk Cousins, and Derek Carr in his first three seasons. While QB Wins is not a stat that we should use to evaluate quarterback play, because you’re paying not only the production of Dak Prescott, but also the intangibles if Dak Prescott, you have to look at the wins. 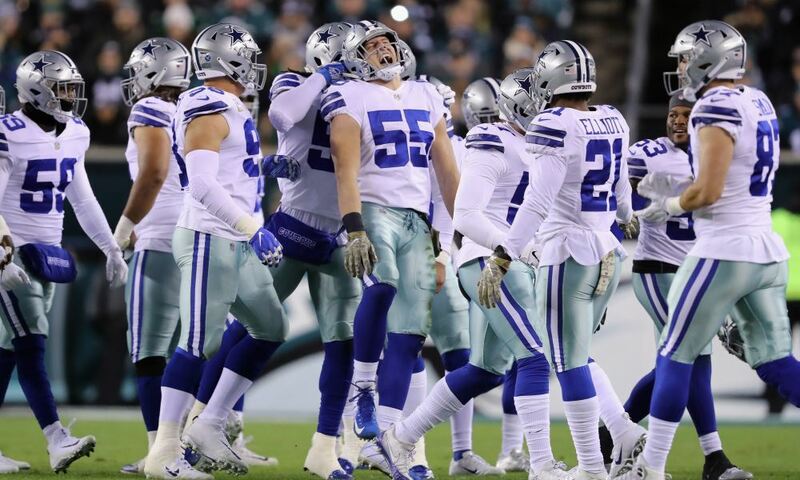 The Dallas Cowboys have gone 32-16 in the regular season with Dak Prescott at quarterback and 1-2 with him in the playoffs. That, in only three years in the NFL. He's going to get better as a player. Even if you don't look at QB Wins, Dak Prescott has been as productive as those guys he's mentioned with, aside from Brees and Rodgers. These comparisons below look at the two years before the quarterback signing their franchise quarterback contract. Here you see that Dak compares favorably to Russell Wilson, Cam Newton, and Kirk Cousins. As you can see above, over the last two years, Dak Prescott's averaged more passing yards per game, nearly as many touchdowns per game, fewer interceptions per game, and a comparable passer rating to Newton and Wilson in the two years before they signed their big contract extensions. His completion percentage That doesn't consider his play during the 2016 season in which he won rookie of the year as the starting quarterback for a team that went 13-3. Derek Carr became the highest-paid player in NFL History after his third season. He signed a five-year, $125M extension. Here's his first three seasons next to Dak Prescott's. RJ Ochoa, formerly of Inside The Star and now of Blogging the Boys, provided a nice comparison between Derek Carr and Dak Prescott in their first seasons in the NFL. When Derek Carr signed his contract, he became the highest paid player in NFL history. The projection provided by Spotrac of $25.2 million is the floor as it would be just above Derek Carr's contract that he signed 2 years ago. It's entirely possible that Prescott signs a contract for more than Matt Ryan and could potentially become the highest paid quarterback in the NFL, but I'm going to estimate that Dak Prescott receives a five-year deal for $145 million, which would give him $29 million per year. 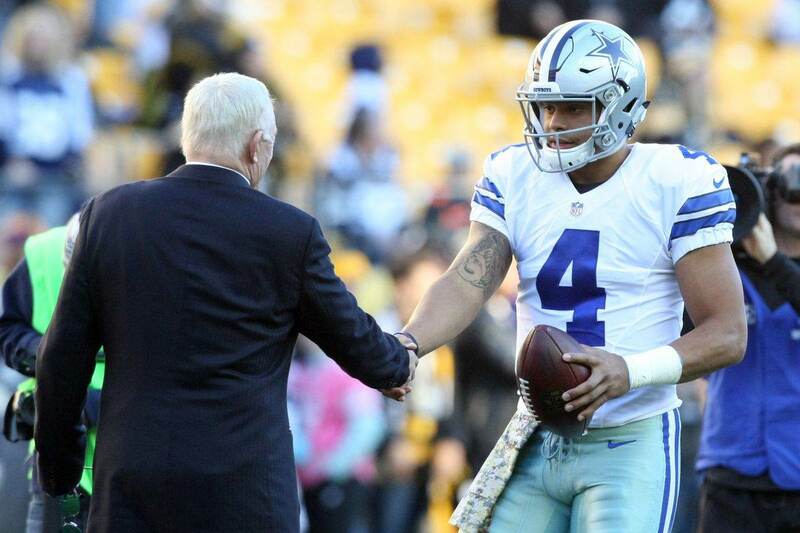 Jerry Jones has been adamant over the course of the season about his desire to get a long-term contract done with Dak in the offseason. Jerry Jones is the owner and the general manager, so it's only a matter of time before Dak's representatives and the Cowboys front office hammers out the final numbers. Dak Prescott is going to get a big deal and bigger than many in Cowboys Nation want to give him. But the going rate for franchise quarterbacks in the NFL is that number that Jimmy Garoppolo signed.